The best glass engraving DVD. This DVD will take you through engraving on black glass. You will learn how to create a two dimensional image using glass. 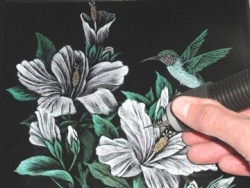 You will see how to engrave a humming bird and floral scene and learn never seen before coloring techniques using SCM's color inlay process. This DVD is a must for every engraver.